APD Dumfries won through in their opening Murgitroyd Scottish Twenty/20 Cup match at Hawick on Sunday winning by 107 runs after posting a huge total of 181 for 3. Davie Davidson hit 62 not out and Alan Maskrey and Niall Alexander each took three wickets in Hawick’s reply of 74 all out. Hawick put the visitors in to bat and Dumfries intentions were made clear when Scott Beveridge smashed three sixes in the second over. He carried on hitting boundaries but was run out for 42 with the side on 67 for 2 in just the 7th over. Davie Davidson and Josh Geary maintained the impetus until the penultimate over when Geary was out caught for 47. Davidson finished on 62 not out with 181 runs on the board for the loss of three wickets to put the required run rate for Hawick at nine an over. Chris McCutcheon took a wicket with his first ball thanks to a catch by keeper Davidson. He and Maskrey kept Hawick subdued with Alan Maskrey taking three wickets to remove the top order. The teenage change bowlers of Stephen Temlett and Niall Alexander were also successful. Temlett swung the ball to take two wickets and Alexander took three, including Hartop for 17, as Hawick tried for the required run rate. The pair bowled in tandem to reduce Hawick to 51 for 9. It was left to Cross to buy the final wicket as Stewart holed out for 24 and Hawick finished on 74 after 15 overs. Two catches for promising keeper Davidson and three in the slips sealed a good afternoon in the field for Dumfries. The side now wait to hear their next opponents in the South qualifying section of the competition. In contrast to the hectic Sunday afternoon, the home match against Kelburne in National League Division 2 on Saturday was finally abandoned in late afternoon without a ball being bowled due to rain. However Dumfries remain top of the table as the only unbeaten side in the league. The Dumfries club welcomes new players, juniors and seniors. For more information on the Monday night junior sessions, midweek, friendly and league cricket at Nunholm contact Trefor Williams on 01387 256455 or see http://www.dumfriescricketclub.co.uk. JMS Nunholm were on the wrong end of a fine bowling performance in their game against Kilmarnock in Western Union Division 2 on Saturday. The portents looked favourable after Kilmarnock chose to bat on a firm wicket of variable bounce and were three down for just over thirty, Chris McCutcheon and Stuart Alexander each dismissing an opener. However the middle order revived the innings with Saeed, in particular, going for his shots to hit 65 runs. He was well supported by Laidlaw (39), McFadzean (27) and Khan with 43. The bowlers stuck to their task and they needed to with a century partnership for the 4th wicket and a seventy partnership for the 6th. However rewards came with, ultimately, 5 wickets for McCutcheon, catches for Reed behind the stumps, and Andrew Forsyth coming back well to take 3 wickets, two comprehensively bowled. Kilmarnock were finally all out for 237. However in terms of bowling performances the kudos went to Khan who opened the bowling for Kilmarnock. 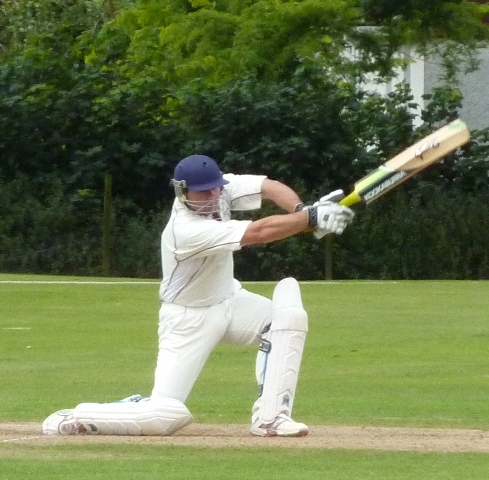 He bowled fast, straight and used the conditions effectively as he cut a swathe through the Nunholm batting. There was an opening partnership of just seventeen but that looked good as a series of batsmen were either bowled or caught by the keeper. Williams used his experience to score 31 but Khan was on course for a deserved all ten wickets until McFadyen and then Pasha took the final two wickets to end a bad afternoon for Nunholm, 76 all out. JMS Nunholm lost to Kilmarnock. Away match. At Nunholm on Sunday Scotland U15s play Cumbria in their first game in this year’s ECB Under 15 Championship and good weather is also hoped for at the ground on Friday afternoon for a cricket festival involving local Primary Schools. APD Dumfries face an away double header against RH Corstorphine at the weekend. The sides meet in National League Division 2 on Saturday. Then on Sunday they play again in the second round of the Scottish Cup. JMS Nunholm are at home against GHK in Western Union Division 2 on Saturday.